While our top story from the first rest day (the rise of Tomashevsky) has continued unabated, there is now a second key story line at play in this event: the fall of Grischuk. While Tomashevsky scored 2.5/4 and maintained his full point lead over the field, Grischuk dropped two games, scored only 1/4, and fell firmly out of contention. In this post we will be examining the deeper ramifications (both obvious and subtle) of these two players’ results, as everything else depends on them. First the obvious: Tomashevsky’s position has improved greatly. While his lead hasn’t actually grown, it should be obvious that a full point lead over just one player, with only three games left, is a far stronger advantage than a full point lead over three different players, with seven games left. Evgeny didn’t particularly need to extend his lead, merely hold serve as others fell off the pace. In this case it was Grischuk and Giri who dropped further behind, while noone else closed the gap. How much better is Tomashevsky looking at this point, than before? In the last four rounds his odds of winning the event outright have improved from 31% to a whopping 79%! His expected score (in Grand Prix Points) is now 164 – keeping in mind that you score 170 for a clear first, and just 140 for second. Even the one time in five that he doesn’t win outright, he will almost always share first, usually with only one other player, and still bring home 155 points. His odds in the overall Grand Prix standings, meanwhile, are now up to a 42% chance of finishing top two (and qualifying for the Candidates Tournament). This is a humongous gain over his round four position, when despite his great start he had just a 17% chance, or especially over his pre-tournament odds when we evaluated him as having only a 2% chance of being a Candidate for the World Championship next year. Here are average expected points scored at Tbilisi, and odds of winning first place outright, for all players. You may notice that it isn’t much of a race at this point. While it has little bearing on the overall Grand Prix standings, or even on the results at Tbilisi, we would like to highlight how impressively Jobava has bounced back from an atrocious start. After managing just one draw and three losses in the first four rounds, he has won three and drawn one in his last four rounds, returning to an even 50% score for the event, and bringing his live rating back above 2700. Grischuk, on the other hand, has fared most poorly over the past four days. As the highest rated player in the field, he was expected to score well more often than not, so after round four we saw him as the most likely contender to potentially chase and catch Tomashevsky. Instead he tumbled. Where before we expected him to score an average of 113 Grand Prix Points, now we see him picking up only 59, which would not keep him alive in the overall Grand Prix standings. By virtue of his rating, he remains one of the favorites in the final event at Khanty-Mansiysk, but at this point his overall odds of reaching the Candidates Tournament via the Grand Prix are just 12%, whereas four games ago we had him at 41%. If he is going to get there, it will have to start over the final three rounds of Tbilisi. He has no realistic hope of winning this event, but if he can win a game or two and rise in the standings, it would gain him critical extra Grand Prix points that would keep him at least somewhat in contention overall, and keep his results relevant at Khanty-Mansiysk. You may notice, from the numbers above, two other major beneficiaries of Grishcuk’s collapse: Hikaru Nakamura and Fabiano Caruana. While sitting on the sidelines, these two have seen their chances improve significantly over the past four rounds, improving eight percentage points each over where they stood at the first rest day. Why? As the leaders in the overall Grand Prix standings prior to this event, they were in the best position to benefit from the rise of a relatively weak favorite at Tbilisi. While we don’t wish to take anything away from how impressive Tomashevsky has been at this event, he is still rated 50-60 ELO lower than the top rated players in the Grand Prix, and so our model projects him as less likely to repeat his success at Khanty-Mansiysk than, say, Grischuk or Giri would have been. So having more of Tbilisi’s Grand Prix points likely to be awarded to lower rated players puts Caruana and Nakamura in much better positions to maintain their leads through the final leg of the Grand Prix. One final consideration that we mentioned in our last post is the rating mark of 2800. Both Grischuk and Giri have fallen below it in the current live ratings, but they still have three rounds to rebound. Both are now underdogs to get their end-of-tournament rating (presumed to become official on the next rating list) back above the 2800 line, but neither is completely eliminated. Giri would need to score 2.5/3 in the final rounds, with the black pieces in two of those three games, and our model predicts him to do just that 14% of the time. Grischuk also needs to score 2.5/3, but has the benefit of two games with white, and so has a slightly better chance at 21%. Still, it now looks likely that the official March rating list will have only two 2800+ players on it – despite there having been five at the same time rated over 2800 in the live ratings earlier this month. All told, the results over rounds five through eight have removed much of the drama from Tbilisi. Tomashevsky is now an overwhelming favorite to win the event, and has turned himself into a legitimate contender for one of the eventual Candidates Tournament spots. Of course he still has to navigate the last three rounds: he has roughly a 90% chance of at least sharing first place, but 10% is still 10%, and he has a job to do to close out the win. The other most tangible question is whether Grischuk can bounce back, manage at least a plus score in the last two rounds, move up the standings a bit, and enter Khanty-Mansiysk as a contender. We have about 20 hours until round 9 begins. In the meantime, hopefully this update gives you something to chew on during this rest day! We probably could have titled this post “The rise of Tomashevsky”. Certainly the biggest story is Evgeny Tomashevsky’s blistering 3.5/4 start, and full point lead after four rounds (out of 11). You may already know that we are tracking the Grand Prix in detail, and running simulations to determine each player’s odds of finishing in the top two of the final standings and earning a berth in the 2016 Candidates Tournament. Well four days ago, before this event began, we were awfully pessimistic about Evgeny’s chances, giving him a mere 2% chance of doing well enough both here in Tbilisi and also in Khanty-Mansiysk to finish in the top two. Now? We have his odds up to 17%! He still has an uphill climb before he convinces our ratings-based simulation model that he’s an actual “favorite”, but he has nevertheless made tremendous progress. Poor Jobava. His slow start has been just as bad as Tomashevsky’s has been good. At this point, pretty much his best realistic hope is just to share last place with someone. You can see, though, that if there is a clear winner it will be Tomashevsky almost half the time! His lead really is quite commanding, even with seven rounds left, but certainly nothing has been clinched yet. So if Tomashevsky does take a clear first place and earn 170 Grand Prix points, what does that mean for his overall chances of qualifying? It would give him 252 points through two events, since he earned 82 at Baku, but how many points will second place ultimately require? Well, we began tracking this in our simulations, and have determined that the average score needed for second place in the final standings is 327. So if Tomshevsky wins, he’ll still need 75 more points at Khanty-Mansiysk to reach that target. Of course there this is an oversimplification, and 327 does not magically guarantee a Candidates berth, as there is a very wide range of possibilities. 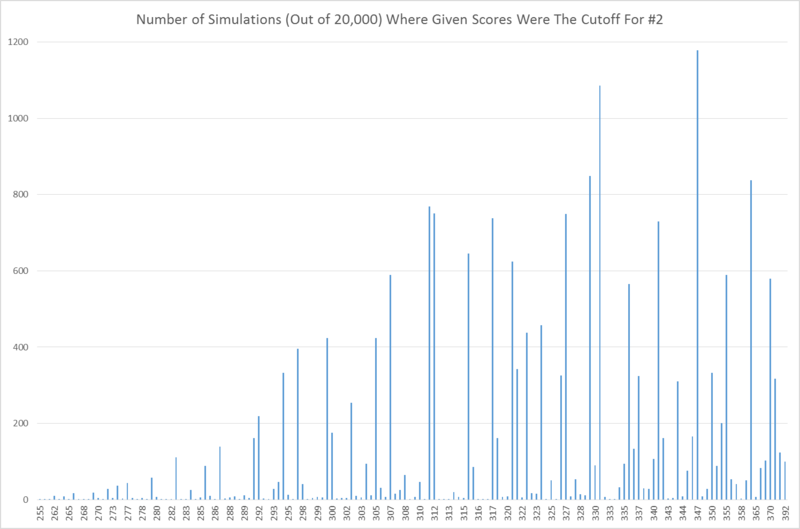 Across 20,000 simulations, we saw qualifying targets as low as 255, or as high as 392! The latter value can only happen in one precise way: Grischuk must win Tbilisi outright for 170 points, then finish exactly second at Khanty-Mansiysk for 140 more, giving him 392 total, AND Caruana must win Khanty-Mansiysk outright bringing his own total to 400 points even and first place overall. 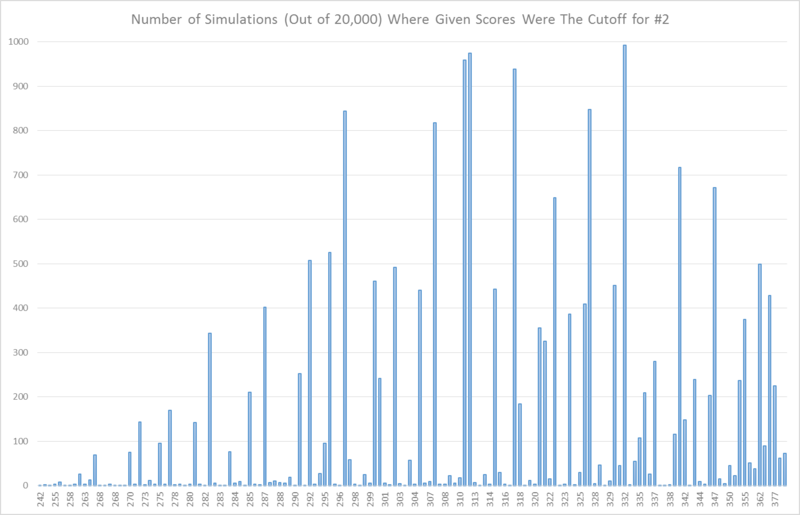 Despite the fact that this is an incredibly specific series of events, our simulation shows it happening once every 200 times (0.5%). This is surprisingly often, for one exact outcome, and shows how much our model respects Caruana and Grischuk’s high ratings, in its simulations. So if we know the expected average result for each player at Tbilisi, do we have it for Khanty-Mansiysk as well? Of course! Here we have every player’s actual scores for Baku and Tashkent, along with their expected scores for Tbilisi and Khanty-Mansiysk, and their average overall scores. We also included their current odds of finishing in the top two in the final standings, in order to highlight that it doesn’t necessarily track perfectly with expected scores. That is because expected scores are an average of all possible results, while top-two odds are skewed heavily towards the odds of particularly good results. Some players have a higher risk/reward factor in their remaining slate, that allows them to have higher odds of reaching the Candidates despite not having a higher expected score. And finally, we looked at one more consideration. The “2800 club”! While live ratings are something we love to follow along with, there is a certain gravitas that comes along with actual published ratings. So the question is: when the March rating list comes out, how many 2800+ players will we see? Nakamura flirted with the mark at Zurich, but fell short in the end. Caruana struggled at Zurich, but managed to stay above the 2800 plateau. Carlsen will be there of course, so that’s two. And then there are Grischuk and Giri, both of whom are playing at Tbilisi. What are their chances? Well Grischuk is in pretty good shape. Although he loses a little bit of rating with every draw, as the highest rated player in the field, his 9.7 point cushion (current live rating of 2809.7) is enough that as long as he scores 50% the rest of the way he’ll be fine. However if he drops to a negative score, at only 3/7 or worse over the remaining rounds, his rating would fall below the magic 2800 mark. According to our simulation, his chance of scoring at minimum the needed 50% in his remaining games is 82% (as he’s a favorite in all but one of them, the lone exception being when he has the black pieces against Giri in round 8). Giri is in a slightly tougher spot, as he has no real cushion at all, currently sitting at 2800.4 in the live ratings. Since he also loses rating points with draws most of the way, he needs at minimum a score of +1, or 4/7 the rest of the way, to keep his rating afloat above the 2800 mark. Actually, 4/7 would drop his live rating to 2799.8, but fortunately that’s good enough as FIDE would round up. Scoring +1 is a tougher task than just maintaining an even score, but Giri is favored in all 7 of his remaining games (thanks to having the white pieces, which we rate as being worth 40 rating points) against Grischuk. As such, Giri is a favorite to score at least the 4/7 he needs: we rate his chances of a published March rating of 2800+ to be 63%. We hope you enjoyed this interlude as a palatable replacement for actual chess on this rest day. Perhaps turn your attention to the rapid games at Zurich, to keep yourself entertained. We will post another update at the second rest day, so please let us know if there are any other stats you’d like us to take a look at!